Jennifer Lawrence's Dior gown at the 2013 Oscars is not audition-appropriate, but it's fantastic. Auditions are fun, right? Completely fun. I know it gets old sometimes, but I always did find the ritual of dressing for an audition quite calming. Something to do other than be nervous, I figure. I do like the mini fashion-show with which I’m presented at any audition venue; I like noticing which mezzos stubbornly wear their best dress to sing Siebel (why not? ), and whether or not the baritones are the type to match their shoes to their whatever (hey, Cameron McPhail). I figured I’d nod to celebrities, who actually do live in scrutiny of what they wear, as ridiculous as that is in the general sense. Among the swan dresses and meat dresses and Beyoncé at the Met Gala, do today’s celebrities give us audition-appropriate inspiration? Turns out, yes they do. *For the record, I intentionally left men out of the picture, largely because I don’t know much about men’s fashion (perhaps a follow-up for men is in order, by one of my men’s clothes-conscious readers). Men, as long as your suit is not too small, not too large, and ties are sported judiciously, it’s a winner for me. 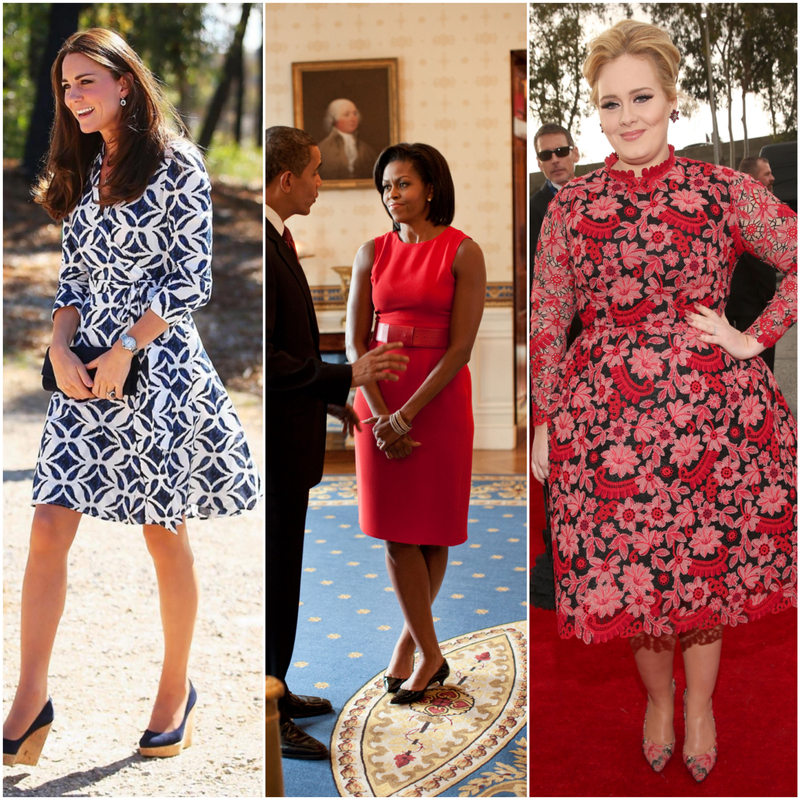 Kate Middleton in Diane von Furstenberg, Michelle Obama in Oscar de la Renta, and Adele in Valentino. Three great ladies, right? The thing about these dresses is that they look great on lots of body types, and they work for daytime, which is when you’ll sing most auditions. Plus, the more classic the shape of the dress, the longer it will stay in style; really, auditions aren’t a place to try out the cutting-edge of trend, but something like Adele’s print is a great way to show some personality. DVF wrap dresses do fall above the knee for most, and that’s something to consider, especially if you’re going to be singing on a raised stage (Bionic makes a great wrap dress in a few patterns that are a little longer - if you’re in Toronto, Cat’s Cradle on Yonge sells them). Michelle Williams in Louis Vuitton, Jennifer Aniston in Burberry, and Heidi Klum in her LBD. I’m a pianist, so I love wearing black. I think it’s a great audition option, especially if there’s an interesting cut or detail to the dress. Michelle’s little bows are cute - very coloratura soprano. Klum’s dress is a bit dressier; may be good for a higher-end audition venue. And I mean, how great is this suit? Lucky mezzos; this Burberry suit would actually work well from, say, Sesto to Rosina in a standard two-aria audition. Emma Watson in Elie Saab, Cate Blanchett in Lanvin, Mindy Kaling in Tadashi Shoji. In red-carpet terms, these dresses are hardly screaming “remember me!” the way Bjork and Cher and Lady Gaga always do. But ornate beading on a simple dress can get the auditioners to listen to you just a little bit more intently. If you’re tall, something like Cate’s Lanvin could be pretty striking, too. Simply cut as it is, Mindy’s bright green choice would make an impression on me, no doubt. Sofia Vergara’s top half, Taylor Swift in Zuhair Murad, Natalie Portman in Givenchy. So, Sofia looks pretty great, but no one should ever wear this to an audition. If you wear this to an audition, no one will listen to you sing. Taylor’s dress is pretty, but definitely too short for a standard audition; it’s one for the opening night party after you’ve gotten the gig. Natalie’s dress is, well, you just couldn’t fit it in a suitcase. Or garment bag, probably. Impractical. Cate Blanchett in Dior, and Rihanna in Giambattista Valli. Audition-inappriopriate as these dresses may be, I’d play extra hard for any singer who showed up in either of these. I kind of love that Dior gown.